Delightfully Different (published by iUniverse) is an award-winning novel by D. S. Walker that offers a poignant glimpse into the life and mind of a girl with Asperger’s Syndrome. With an extensive vocabulary and insight beyond her years, Mia Lung is a beautiful spirit who soon realizes extraordinary musical talents. Though subtle signs emerge early on, such as not liking to talk on the phone or walk barefoot on the grass, her condition remains undiagnosed until later in childhood. 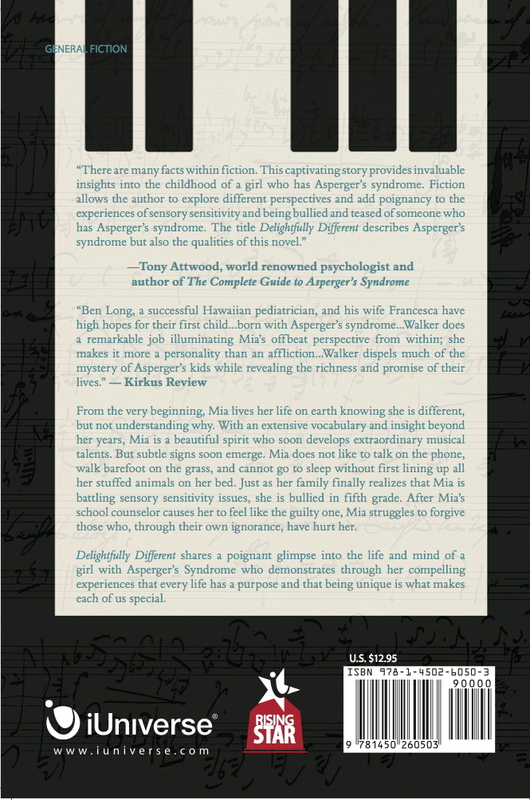 Throughout her childhood, Mia learns how to manage her sensory sensitivity, embrace her extraordinary musical talents, overcome the anger caused by bullying and strengthen her relationships with others. Walker’s message appeals to girls who see themselves as different and to those who have experienced bullying, as well as to parents and teachers who can help teach the valuable lessons of kindness and acceptance for other people’s differences. Amazon.com: Delightfully Different by D. S. Walker: Books. BARNES & NOBLE | Delightfully Different by D. S. Walker | NOOK Book (eBook), Paperback, Hardcover.